Not that long ago, eight dachshund puppies were found in a plastic container behind a church in Arkansas. The kind folks at Rocky Ridge Refuge rescued them, and guess who their foster mom is? 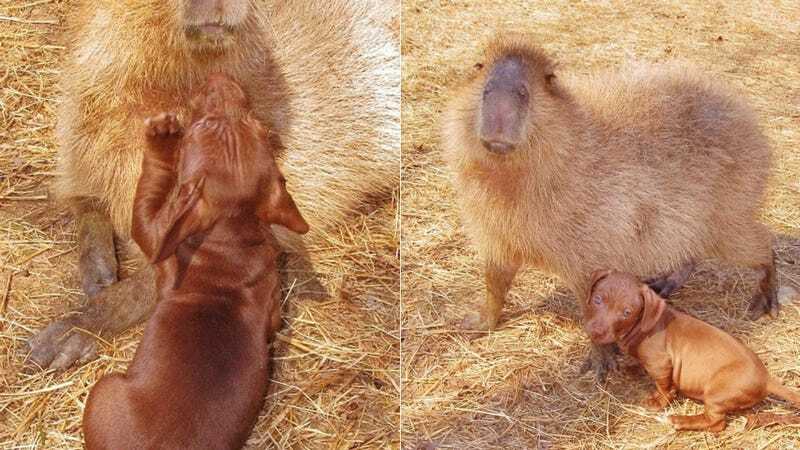 A giant capybara named Cheesecake. A CAPYBARA named CHEESECAKE. Come on! According to RRR, the puppies are doing well under Cheesecake's loving care and supervision, and will soon be available for adoption. Unfortunately, Cheesecake is the one wiener dog you can't take home.